The Legends Resort provides a unique and varied golfing challenge, thanks to its five championship courses, which are set within a stunning natural landscape. With a distinct Scottish theme throughout the resort, visitors from the homelands will feel they have found a golfing home away from home. The Heathland Course was conceived by Tom Doak, whose love of links golf is plain to see in his design; stylistic influences result in echoes of St. Andrews, Lahinch and Cruden Bay, which are seen by many as representing golf in its purest form. Whilst the Heathland is not particularly long - 6,785 yards - its difficulty is borne from the persistent coastal winds that combine with the thick rough and testing bunkers to present a formidable proposition. 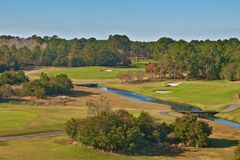 The Parkland Course was opened in 1992, and since then it has both matured nicely and established an enviable reputation as one of Myrtle Beach's best new layouts. Elements of Dr. Alister Mackenzie's trademarks are evident around the Parkland, which may seem straightforward on the surface. From the tips, the course reaches 7,170 yards, and its subtle greens are ringed with intimidating bunkering. The Moorland is a spectacular celebration of modern resort golf, where designer Pete Dye has created a remarkable layout that is reminiscent of the celebrated stadium course at PGA West. The Moorland (6,799 yards) was opened in 1990 to critical acclaim, and while it may not be golf as we are used to in the UK and Ireland, it is certainly entertaining, and continues to delight golfing visitors to Myrtle Beach. The excellent Legends Resort boasts two and three-bedroom condominiums that are tailor-made to suit the needs of visiting golfers. The units located near the Heathland, Moorland and Parkland courses, and are fully serviced, giving the self-catered apartments welcome hotel comfort. Each condo comes complete with a fully fitted kitchen, washer/dryer, cable television and a separate living area. All are spacious and extremely comfortable, offering instant access to Legends' remarkable golfing complex. For an unfussy yet very convenient base, the apartments at Legends Resort tick all the boxes for visiting golfers - great value for money, the Myrtle Beach attractions just a short hop away, and championship golf on the doorstep. Golfers can ease the inevitable aches and pains with a soak in the jacuzzi at the Legends Resort, which also boasts tennis courts and two outdoor swimming pools. The resort's Ailsa Bar is a Scottish themed watering hole that is an obvious favourite with Myrtle Beach golf holiday regulars.